The city government closes for Emancipation Day and several celebrations take place before and on DC Emancipation Day. 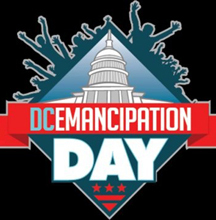 The District of Columbia commemorates every April 16 as DC Emancipation Day. The city government closes for Emancipation Day and several celebrations take place before and on DC Emancipation Day. The Day celebrates President Lincoln’s signing of the DC Compensated Emancipation Act of 1862. DC, in 1862, was a city of contrasts. It was a thriving center for slavery and the slave trade and a hub of anti-slavery activity. Members of Congress represented states in which slavery was the backbone of the economy, and those in which slavery was illegal. One result of the intense struggle over slavery was the Act that ended slavery in Washington, DC, freed 3,100 individuals, reimbursed those who had owned them, and offered the newly freed women and men money to emigrate - - or leave the only country they had known. Griot Baba-C will help celebrate The Act, which paved the way for the Emancipation Proclamation and Juneteenth Celebrations, at the Francis A. Gregory Library, 3660 Alabama Ave SE, Saturday, April 13 at 11a. He also participated in Read Africa @ The Francis Gregory Library that the Port Of Harlem Gambian Education Partnership cosponsored. Port Of Harlem contributor CR Gibbs will be a part in a panel discussion on the documents at the National Archives, 7th and Constitution, NW on Tuesday, April 16, at 7p. He will also be involved in several other events. All events are free. Emancipation Day is also observed in many former European colonies in the Caribbean and areas of the United States on various dates to commemorate the emancipation of enslaved people of African descent in those particular jurisdictions. Read More: The Way We Were: The Emancipation Proclamation in the DMV by CR Gibbs.